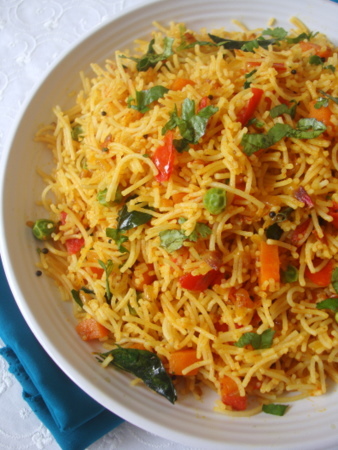 Vegetable Sevai makes for a light, filling and quick-fix breakfast meal. Prepared pretty much the way one would prepare vermicelli/semiya. Adding vegetables of your choice makes it substantial while tofu/paneer adds a dose of protein. 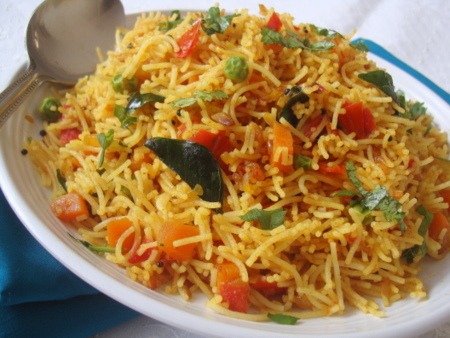 Sevai are a type of rice noodles popular in South India especially Tamil Nadu and Sevai preparations include coconut, lemon and tomato. 1 Boil 4 cups of water and add the rice sevai along with 1/4 tsp salt and 1 tsp oil. Once the sevai is cooked (it should be just soft and not mushy), turn off heat, pour into a colander to drain completely and and keep aside. The sevai cooks fast so watch out while its boiling. 2 Heat oil and ghee in a cooking vessel, add the mustard seeds and let them splutter. Add the black gram and curry leaves and saute them till the dal turns slightly brown and a nice aroma emanates the kitchen. Add the asafoetida and mix. 3 Add the sliced onions, green chillis and ginger and saute for 4 mts. Add the parboiled vegetables and green peas. Cook for 4 mts. 4 Add the chopped tomatoes and saute on medium heat for 4 mts. 5 Now, add the cooked sevai and and mix it lightly and see that no lumps form. Garnish with coriander leaves. Turn off heat. 6 Serve hot with chutney or pickle of your choice. For variation, garnish with grated coconut. You can added roasted cashews too. I still have a mental block about eating salty sevai, too strongly conditioned to think of sevai = dessert! This post with the delish pictures might just change my mind 😉 Thanks for sharing Sailu. I love the savory semiya…usually I make it plain without adding the veggies. My fav anytime,would love to have that whole plate rite now..yumm! hi sailu garu. is sevai same as vermicelli or semiya? Sailu, where did you add Paneer in this ? you mentioned it in the first paragraph. Yummy recipe. Will try it. I did not add paneer. Mentioned that you can add it for variation. lovely dish.. love semiya in any which way!! we have Bambino here, I guess it should work. Happy belated Ugadi to your and your family. I hope the upcoming year brings you lots of peace and happiness. O wow, wht yummmm pics Sailu!! I m so hungry right now since its lunch tym for me….I am feeling like snatching this plate from the pic!! thanks for the post! I was very inspired by the pics and tried it out today….The taste caome out gud but when I added sevai to the vegetables it became sticky…Where could I have gone wrong?? The next time you boil the sevai, add a tsp of oil to the hot water and cook the sevai. DO NOT over cook otherwise it becomes a sticky blob. Under cooking the sevai is the key here. Add enough oil to the vegetables while cooking. Is sevai same as vermicelli ? Semia? Pl let me know . pastas.noodles are not good for health. perfect recipe… tried it for the first time & it came out puurrfecttt…..